Sidney Slon/Pipe Dream Photographer Freshman guard Sam Sessoms scored 28 points as Binghamton swept its season series against UNH on Saturday. In a must-win game, the Binghamton men’s basketball team traveled to the Lundholm Gymnasium on Saturday afternoon to take on the New Hampshire Wildcats. The match saw BU take an early lead in the first half, and while the second half was tightly contested, the Bearcats managed to hold onto their edge until the game’s conclusion. 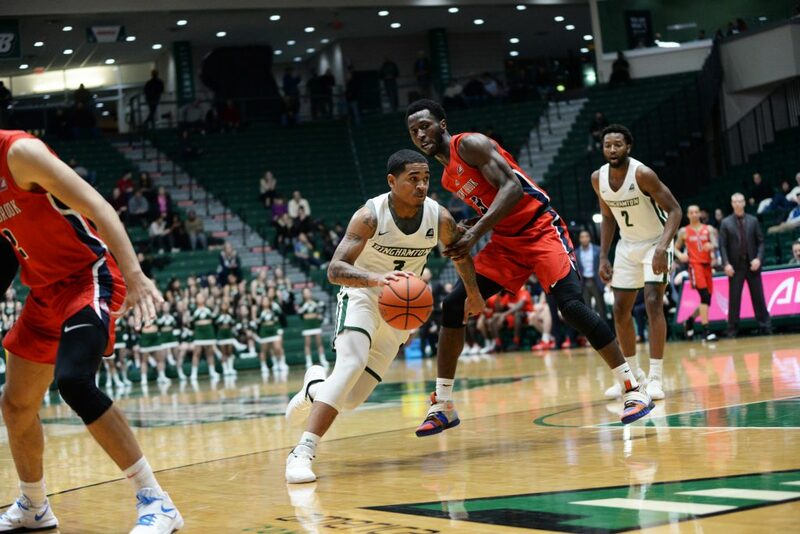 The Bearcats (7-18, 3-7 America East) overcame its opponent by seven points, winning 68-61. With this victory, BU has swept the season series against the Wildcats (3-20, 1-9 AE) this season. BU began the day by going on a 20-8 run, sharing the ball well with many players on the team and scoring points early and easily. The first points in this run came from freshman guard Sam Sessoms, who scored a 3-pointer in the first 20 seconds of play. This was the beginning of a tremendous showing from Sessoms. Down by 12 points, the Wildcats went on a 17-6 run that was capped off with a 3-point ball from junior guard Mark Carbone to bring the home team to within just one point. This differential, however, was the closest New Hampshire came to having the lead, as the Bearcats soon called for a timeout that stymied the Wildcats’ momentum. Binghamton extended the advantage back up to eight by halftime. The Bearcats continued to roll at the beginning of the second period, maintaining a lead as large as 15 points for most of the half. Sessoms posted 10 points in just the first seven minutes of play, a massive portion of his 28 total points that day. The outing marked Sessoms’ ninth game scoring over 20 points this season, and was one of his highest-scoring games of this season, second only to his 32-point effort against UMass Lowell in late January. Sessoms is ranked sixth in the nation in scoring among all freshmen and is in the midst of a standout debut season. The Wildcats tried to come back before the game had finished, but four free throws from Sessoms and senior forward Caleb Stewart in the last 18 seconds of play was all the team needed to keep its edge. UNH sophomore guard Josh Hopkins, who logged 23 points when the two teams last met at the Events Center, ended the day with zero points. With just six regular season games left, the Bearcats’ victory over the Wildcats put an additional game between them and last place, a crucial result for the Bearcats’ playoff aspirations. Binghamton currently sits in a tie for seventh in the AE standings with the top eight finishers in the conference advancing to the playoffs. BU will come back home to host defending conference champion UMBC on Wednesday, Feb. 13. Tipoff is scheduled for 7 p.m. from the Events Center in Vestal, New York.